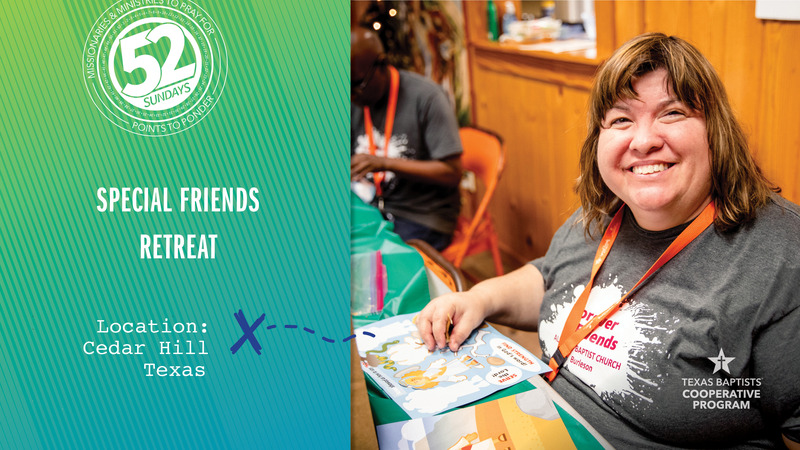 Special Friends Retreat gives those with intellectual disabilities a unique opportunity to have an overnight camp experience. It is something repeat campers look forward to all year long. During the overnight retreat, campers have a chance to participate in Bible studies, worship, games and crafts in a refreshing, safe atmosphere. Parents benefit from talking to other caregivers going through similar challenges and by learning about helpful resources. Special Friends would not be possible without our gifts from our church and others through the Cooperative Program. We help provide scholarships to families who cannot afford registration fees and help cover the cost of stipends for people working during the retreats. Let’s pray for this ministry and for the families and participants whose lives are changed by it.